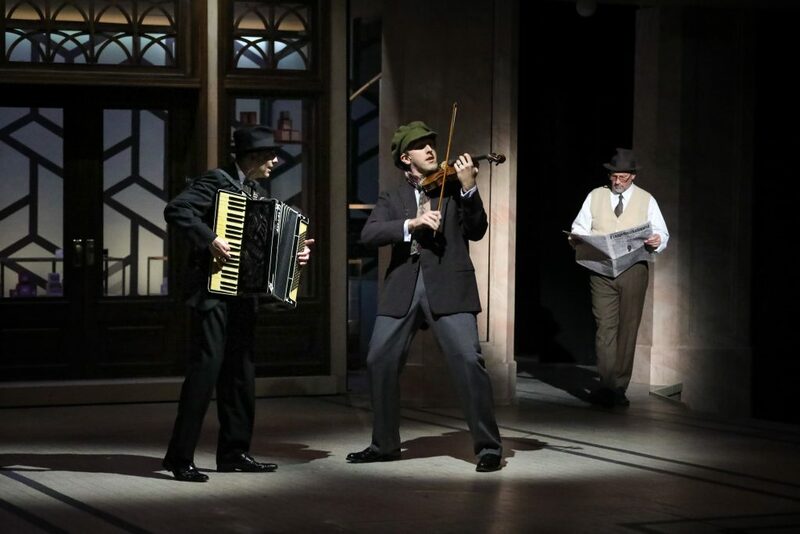 When the musical prologue begins here at She Loves Me—just a couple of street musicians with a violin and an accordion—you’ll realize pretty quickly that this isn’t going to be the lavish orchestrations of the original 1963 production with its 34-piece orchestra. No, music director Mark Hartman and his orchestrater, Jordan Ross Weinhold, have whittled the score down to fill out a 6-piece band. With these things in mind and the help of local musician Wayne Leechford, Mark was able to assemble and orchestrate for a six-piece band of exceptionally talented musicians: PlayMakers regular Alex Thompson on synthesizer, Joan Beck on violin, Paul Hannah holding down the percussion section, Jake Wenger on cello, and music coordinator Wayne Leechford himself on reeds. Together they sit above the action—much as they actually would have in a cafe in Budapest, like the one featured in the “Romantic Atmosphere” sequence—and even become part of the action from time to time. Audiences will find that between the orchestrations and the skill of this Hungarian dance band, Harnick & Bock’s timeless score feels so lush and full that you won’t believe there are only six musicians. So get your tickets and be transported to 1930s Hungary for an evening of love, joy, music, and (of course) ice cream. She Loves Me is on stage at PlayMakers Repertory Company now through Sunday, December 9. Get your tickets today!